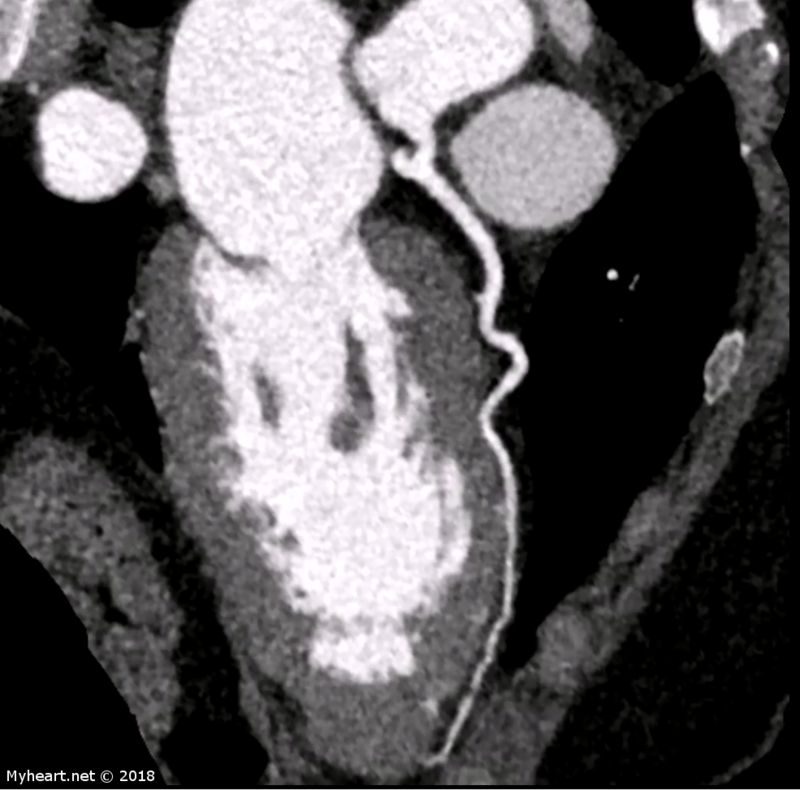 You are here: Home / Aortic disease / WHAT DOES CARDIAC CT SHOW? Noninvasive cardiac imaging has evolved significantly over the last several years. 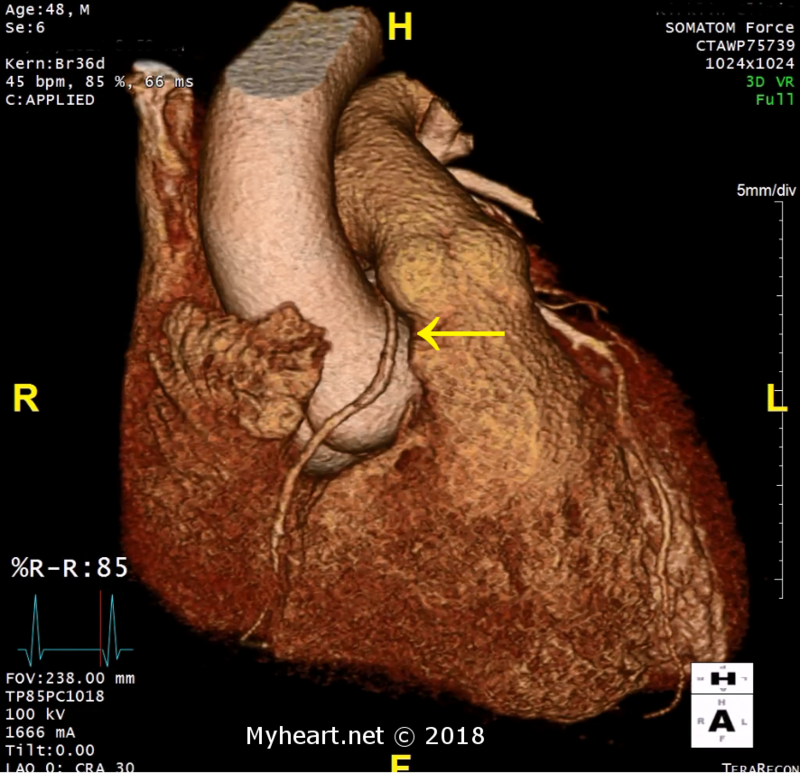 Advances in technology has led to development of newer CT (Computed Tomography) systems with improved spatial and temporal resolution, shorter imaging time, and with ECG gating, allows for the imaging of the beating heart. Cardiac CT is the fastest growing imaging modality in the field of cardiovascular disease. What does cardiac CT show? Some technical aspects. In collaboration with Dr Ricardo Bracer in the radiology department, BBH Princeton has been in the forefront of cardiac CT imaging using a 64 and a 256 slice CT system for the diagnosis of cardiovascular pathology. These high-resolution CT systems allow for better image quality in over 98% of the patients regardless of the body habitus. The studies are gated to the ECG, and a slow heart rate is desirable because the optimal face free of motion occurs during diastole. This is the phase where the left ventricle fills with blood and when the coronary artery perfusion occurs. We encourage the use of a beta-blocker (IV or oral) prior to the study to achieve heart rates of 50 to 55. Irregular heart rates such as seen in AFib or multiple PVCs render the study suboptimal. During the imaging acquisition, we usually asked our patients to hold their breath for 15-20 seconds. This prevents motion artifact. IV contrast is needed to visualize the heart chambers and the coronary arteries. We usually inject 80-100 ml of iodinated contrast material for a typical study. 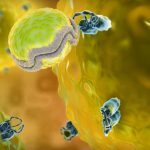 Patients with a previous allergy to contrast are premedicated. In patients with diabetes, we hold the metformin for 48 hours. We discourage contrast CT studies in patients with renal dysfunction and creatinine over 1.8. 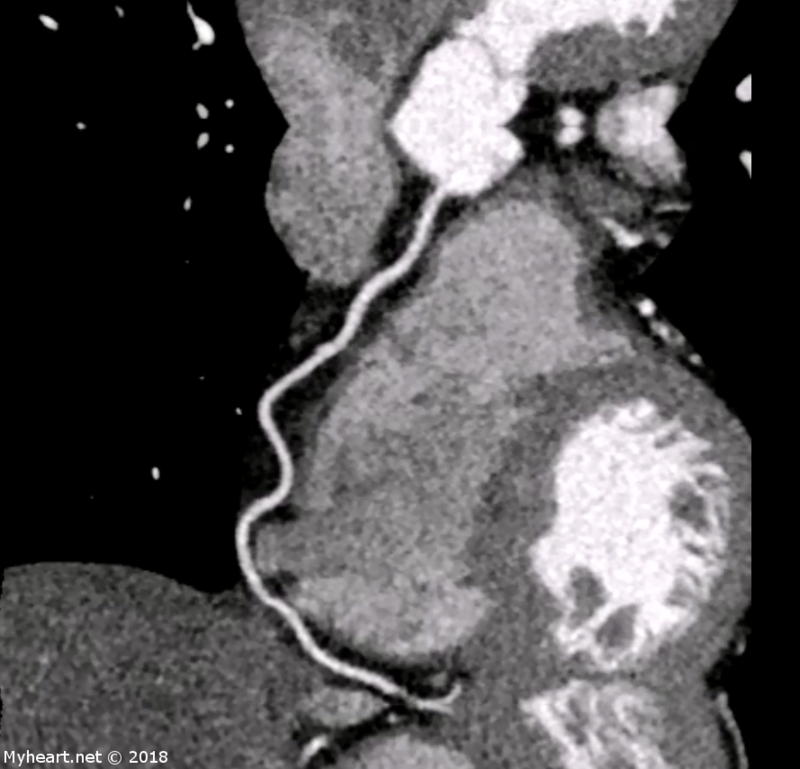 For coronary CT, the volume of acquisition and duration of the scan are reduced. This results in less radiation exposure to the patient. When there is no contraindication, sublingual nitroglycerin is administered to vasodilate the coronaries. The patients are closely monitored by our radiology nursing staff during the entire exam. The radiation exposure is low and for cardiac CT ranged in 15-25 mSv for 64 slice scanners or less and <5 mSv for the new 256 slice scanner. This results in a significant difference in exposure and lifetime cummulative radiation risk. What does cardiac CT show? Calcium scoring (Agatston score). The calcium score is a measure of calcium burden in the coronary arteries. It is based on the radiographic density waited volume of plaque. There is no need for contrast injection. It is a robust predictor of cardiovascular events with a score of greater than 100 increasing the risk ratio to 1.88. 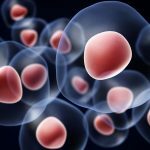 Patients with low ASCVD risks derive very little benefit from the calcium score. However patients with moderate clinical risk and very high calcium score (greater than 300) have been shown to be at high risk for clinical events. What does cardiac CT show? Coronary angiography. 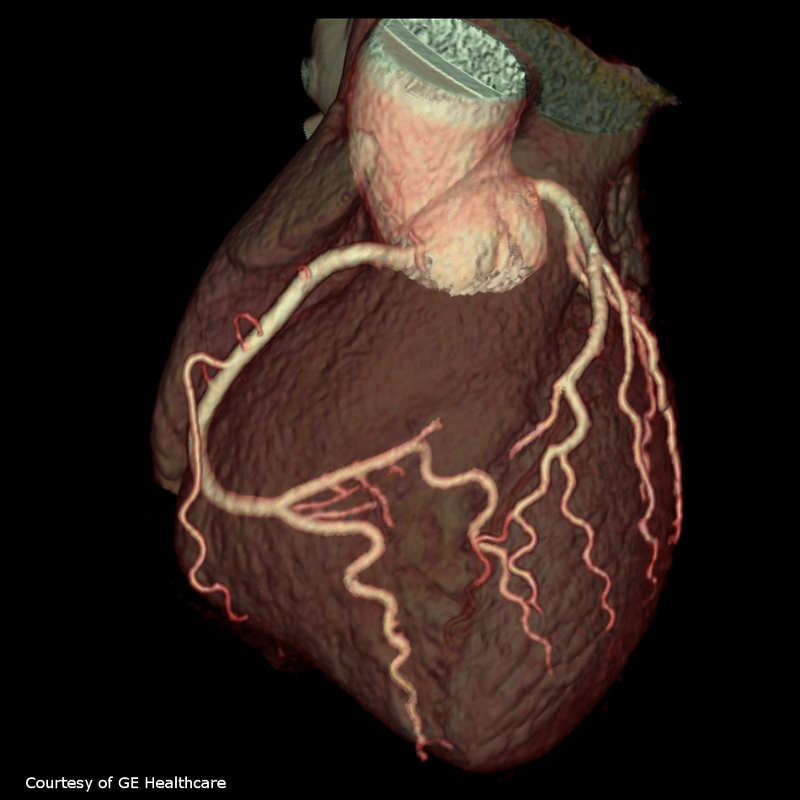 One of the newer cardiac applications of Cardiac CT has been coronary angiography. Higher resolution CT systems allow for shorter breath hold, smaller contrast injection volumes, less heart rate variability and fewer artifacts. Compared to coronary angiography, sensitivity and specificity range from 75-95 percent and 95-99 percent respectively. CT angiography is best performed in patients with lower calcium burden. Partial volume affects and blooming artifacts make it difficult to assess the coronaries in patients with large calcium burden or patients with coronary stents. A regular invasive coronary angiography is preferred in these patients. Below is an example of a patient presenting with chest pain and who underwent a cardiac CT angiography. There is an area of calcified but not obstuctive plaque in the proximal LAD. The patient below had no significant coronary disease. We can see the right coronary artery laid out above the right ventricle (upper image) and the LAD on top of the left ventricle (lower image). 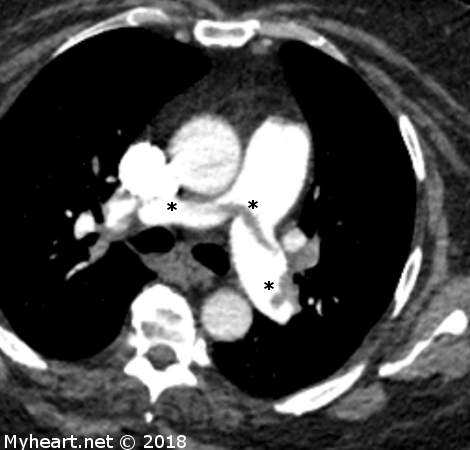 In patients presenting in the emergency department with acute chest pain and low risk for acute coronary syndrome, cardiac CT can reliably identify or exclude significant coronary artery disease. The coronary anatomy can prognosticate adverse outcomes, improve the efficiency in the emergency room and identify important non coronary findings. Here is an example of a patient with large pulmonary emboli. The patient was treated by Dr Ahmed with EKOS and survived a massive PTE. The asterisks indicate the clots in the pulmonary arteries. The following images are from a patient that was treated for aortic dissection. Dr Kyle Eudailey at BBH Princeton specializes in aortic disease. This patient with hypertension, coronary artery disease status post Bypass surgery presented to the emergency room with chest pain and back pain. He was severely hypertensive and had to be stabilized medically. He also developed acute renal failure and was placed on hemodialysis. He continued to have back pain and lower extremity pain and developped flash pulmonary edema. Patient underwent renal angiogram and was found to have an aortic dissection. 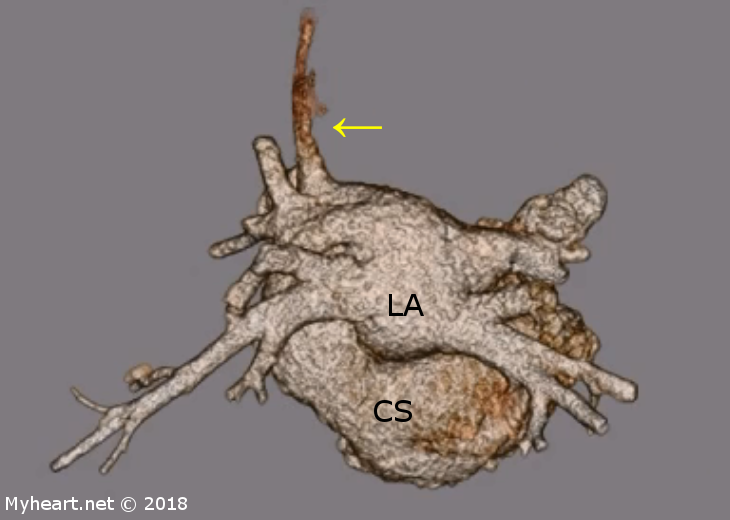 Gated CT scan revealed an extensive type B aortic dissection that extended from the aortic arch (*) just distal to the subclavian to the descending abdominal aorta. The dissection compromized the flow to the superior mesenteric artery, celiac, both renal arteries and the lower extremities. The patient underwent endovascular treatment of this complicated Type B aortic dissection using TEVAR or stent grafting without coverage of the left subclavian artery. Not compromising the flow to the left subclavian was important for this patient since his left internal mammary artery is perfusing his LAD. The patient is doing well and this is the CT scan performed 3 months after the procedure. 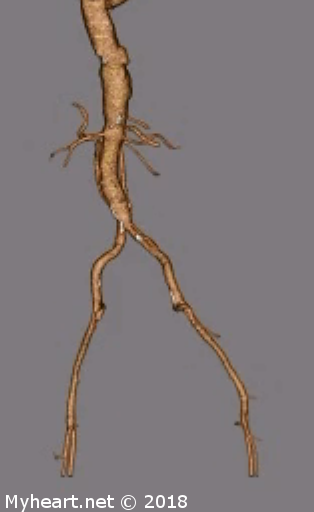 Below is a patient with aneurysmal dilatation of the aortic root with anomalous origin of the right coronary artery from the left main trunk. The patient had hypertension and persistent atrial fibrillation. He complained of progressive dyspnea and decreased exercise tolerance. Over the last year, he developped exertional chest tightness walking up a flight of stairs. Nuclear stress test showed inferior and apical ischemia. 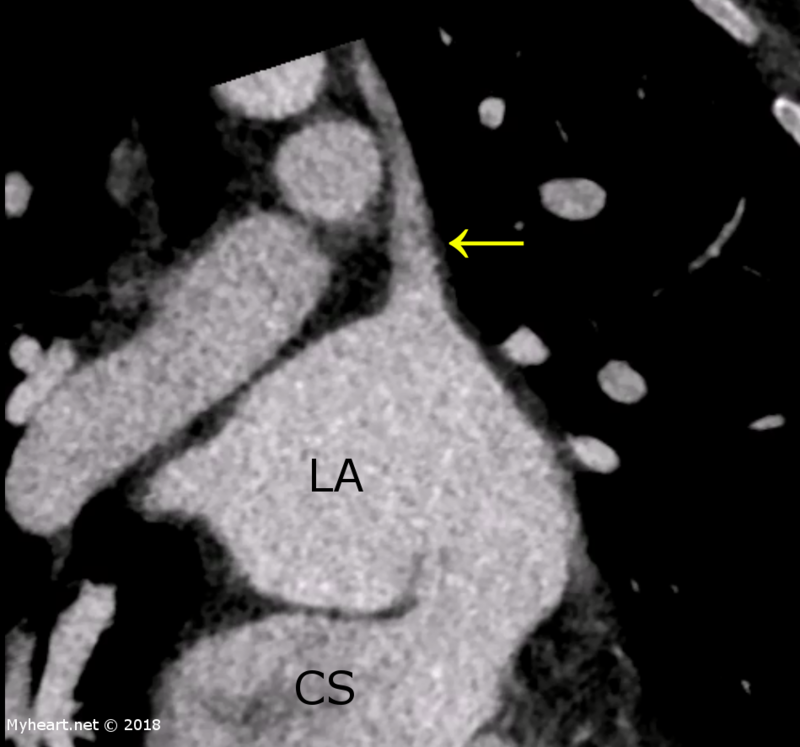 Cardiac CT demonstrated an aortic root aneurysm measuring 5.4 cm and an anomalous take off of the RCA (upper image). The RCA ran between the aorta and the pulmonary artery (lower image). Dr Eudailey performed a valve sparring Aortic Root replacement with RCA reimplantation and an Ascending Aortic replacement. What does cardiac CT show? Evaluation of atherosclerosis. Cardiac CT scan evaluates atherosclerosis by determining the percent stenosis, whether the lesion is obstructive or non-obstructive, plaque burden or plaque composition (calcified versus non-calcified). Here is an example of a patient within non-obstructive eccentric lesion with some calcium on the outer portion of the plaque (arrow). It can also determine whether there is a lipid necrotic core or spotty calcification. A high risk plaque confers a 9 fold increase in risk of a coronary event. What does cardiac CT show? Congenital anomaly. Cardiac CT is one of the most useful technique in evaluating the origin and course of anomalous coronary arteries. It is very important in determining the relationship of the coronary artery to the aorta and the pulmonary artery. It can also detect aneurysm of the pulmonary artery (below) and of the aorta. The pulmonary artery is dilated and measured 5.6 cms at his largest point. The remaining pulmonary tree and the pulmonic valve are normal. In addition, cardiac CT is the most useful tool for the diagnosis of rare congenital abnormalities. Below is an example of an “unroofed” coronary sinus where the common wall between the coronary sinus and the left atrium is absent. 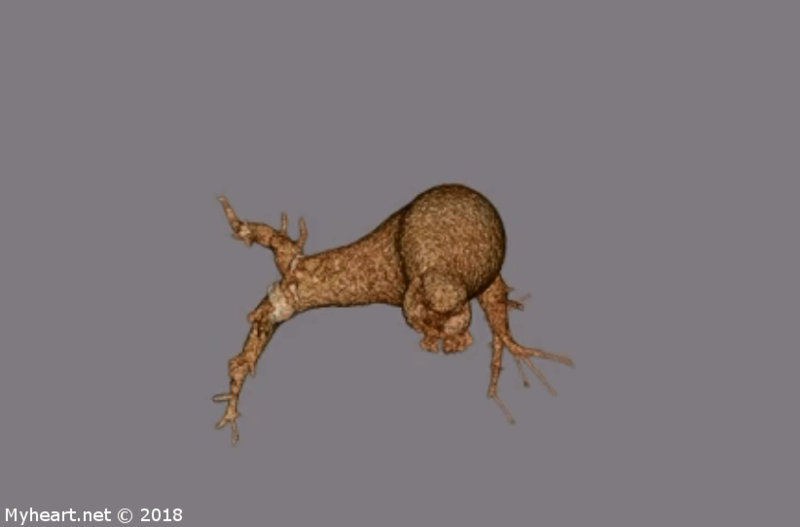 This 3-D reconstruction demonstrate the 4 major pulmonary veins draining into the left atrium, the abnormal left superior vena cava (at 11:00 o’clock) and the dilated coronary sinus (lower portion of the image). It is usually associated with an anomalous systemic venous return such as persistent left superior vena cava (yellow arrow). It is the rarest type of atrial septal defect ASD). The patients can complain of severe shortness of breath and sometimes symptoms of a right heart volume overload such as peripheral edema and even ascites. Our patient is a young women who complained of shortness of breath that has been progressively worst over the last year or two, sometimes present even at rest. She complained also of atypical chest pain and palpitations. As a child, she was reported to have a patent ductus arteriosus that closed spontaneously. The 2D echo showed enlargement of the right atrium and right ventricle with a pulmonary pressure estimated at 40-45 mmhg. Trans-Esophageal Echocardiogram was performed and showed a persistent left superior vena cava, a large coronary sinus and enlarged right sided cardiac chambers. A right heart cardiac catheterization was performed: Pulmonary artery pressure (PAP) 40/19, wedge pressure (PCWP) 17, right atrial pressure (RA) 8. Most interesting were the saturation measured: arterial 98%, superior vena cava (SVC) 80%, RA 94%!, Right ventricle (RV) 89%, PA 88%. Originally we thought we mistakenly mixed up the samples of blood. 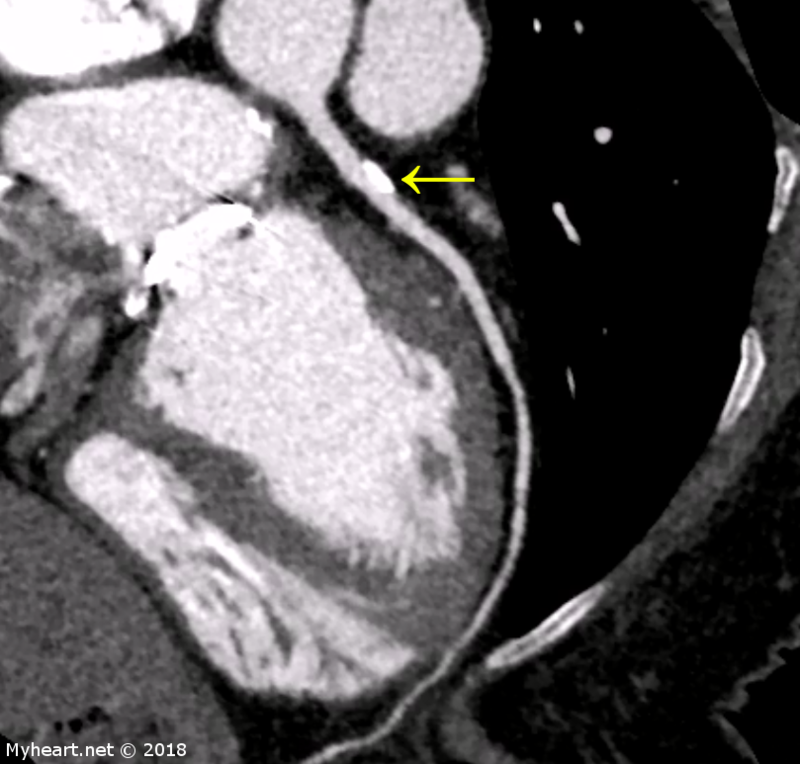 Cardiac CT provided the answers; unroofing of the coronary sinus into the left atrium. You can see the opening between the left atrium (LA) and the coronary sinus (CS). Our patient is scheduled for surgical repair by Dr. Clifton Lewis at BBH Princeton. What does cardiac CT show? Aortic valve disease. Cardiac CT has become a prerequisite imaging element in the evaluation of patient with severe aortic stenosis. For consideration for TAVR or trans-aortic valvular replacement, specific CT scan protocol typically includes imaging of the entire aorta. This includes the aortic root, the thoracoabdominal aorta and iliofemoral vessels. And ECG gated high resolution aortic root acquisition is performed. 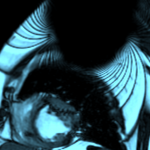 A systolic phase for valve area measurements and annular assessment is performed (see above). This is a patient that was treated by dr Mustafa Ahmed, Dr Clifton Lewis and Dr Kyle Eudailey at BBH Princeton. We would like to acknowledge the expertise of Jay Roberson at VitalEngine. 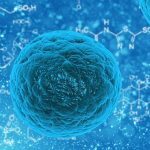 If you would like to read more about valvular heart disease and their treatment, check out some of the articles by Dr Mustafa Ahmed.